Good day, I am Tony, the person behind the Johor Kaki blog. First of all, I would like to thank you for supporting Johor Kaki blog. I appreciate you very much. I am not a food critic or food reviewer. I am just someone (much like many of you) who enjoys good food, appreciate the hard work of the hawkers who made the food, and I want to share my enjoyment with others. I have been enjoying the good food in Johor for more than 20 years. It recently dawned on me that the good food in Johor has not received much publicity; so much so that, there are close friends (even Johoreans) who claimed that “there is no good food in Johor”. I felt that Johor food and hawkers deserve more recognition. 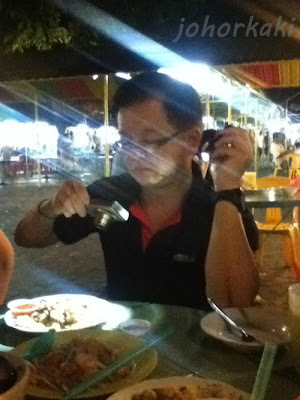 So, on 20 Dec 2011, I started the Johor Kaki blog to document all the good food and hawker stalls that I have tried in Johor. One by one, I hope to put every good hawker and restaurant in Johor on the World Wide Web. I hope that by putting good Johor hawkers and restaurants on the World Wide Web, more people will come to realise that Johor is truly a food paradise. I would like to share how Johor Kaki blog is built, hawker by hawker. What I do is, I will order my food at a hawker stall, eat it and pay for it - the same way as everyone would. If I like the food, I will speak with the hawker about my project and seek the boss' permission to take pictures of her/him at work to feature the people behind the food. I will ask the hawkers about the history of their stall and listen to their interesting stories. I will then write an article and post it on Johor Kaki blog, and Johor Kaki blog Facebook page. I strive to have the human touch in my posts. Writing negative articles damages the business and livelihood of the hawkers and their families. So, if I personally did not enjoy the food, I will just not write any articles about it in Johor Kaki blog. Put another way, the stall or restaurant is not mentioned in Johor Kaki blog. About 1 in 3 eateries that I tried are not mentioned in my blog. Beginning with the Nov/Dec 2012 issue of WAVES Lifestyle Magazine, Johor Kaki articles are featured in the Food We Love section of WAVES. I am grateful for the invite from WAVES Editor Priya, and for the opportunity to share about Johor food and hawkers with more people through WAVES. Recently, Johor Kaki has been receiving invitations from restaurants for food tasting. I would like to state here that the same principles and standards upon which Johor Kaki was started, still apply. I do not receive any fees for the articles posted in the Johor Kaki blog. There are no paid food reviews in Johor Kaki blog. Only difference is, the host is not charging Johor Kaki for the food eaten during the invited food tasting session. I make sure that the restaurants understand that Johor Kaki will post only food I enjoyed and which I sincerely want to share with my readers. I am very grateful for all the support that Johor Kaki blog has been receiving from readers. I am glad that Johor Kaki is able to play a very small part in bringing greater recognition to Johor food and the dedicated hawkers and restaurateurs that worked so long and hard to bring such good food to all of us. Johor Kaki still has a very long way to go, and will keep working at becoming better and more helpful. Grateful for your patience in reading this long post. Thank you and wish you happy reading, happy eating. Thanks Tony! Continue your good work, really enjoy your posts and appreciate all the info given. Been a great help! I will Jaysiva :) Thank you. Hi, Tony, really appreciate what you have done for food lover like me. I have been staying in JB all my live n I din know some of these hawkers exist. Keep up with the good work. Wishing you and your family a Merry Christmas and a Happy New Year. Thank you, Kathy C. My best wishes to you and your family too. Whenever I'm in Johor, my choice has been limited till I stumbled upon your blog. Now I have more exciting makan places to explore. At times the pictures looks better than the food itself, however, still glad to try it out. We are thankful for your great effort to document and share with everyone for all the good food that you tasted during your journey. It was just recently, I google for a makan place in JB, I came across your website, and went to try one of the stalls. I remembered it was YA WANG near the CIQ. That was great, then I look thru your site and went for a 2nd stall.. and this went on and on.. It was such a fantastic experience till I book a hotel in JB, to follow thru more food at your site ! I hope that you could keep up your unbiased food review ! This is definitely my number choice for a JB food blog ! Thanks. Thank you Patrick for the kind compliments. Wish you more happy reading and happy eating. keep up the superb job and we will support you in any way you require to ensure that JK become a food dictionary one day. All the best from the "House of Sarawak Kolomee "
Hi! I am really enjoying your blog. I see that you have tried quite a handful food from Kluang. Maybe you do not want to miss the Botak Mee and Kuey teow too. You should also try the Botak Mee (which is Behind Old Coronation Cinema. Famous Botak Curry Noodles) and Brilliant Theatre Fried Kuey Teow (Near the Botak Mee as well). After you cross the Railway track, heading towards the town, take the right (in front of the TOTO shop),pass JohBase hotel signboard, go straight till you come to a T junction (you will see a Bridal shop on your right of the T-Junction). Turn left and you will pass a big Chinese Hall on your right. After the hall, turn right into the parking area. You will see a stall with an uncle frying kuey teow and with lots of smoke. That is called Brilliant Theatre Kuey Teow - the Chinese hall used to be a Cinema called Brilliant Theatre in olden times. COme out of that parking area (you can actually walk from there to the Botak mee stall), turn right and then take the left into the small lorong just before the river. You will see lots of old stalls on your right. you will find Botak Mee signboard there - it is the 2nd stall with a young chap behind the wok. The mee is given with a sambal and it is just good. Beside it is also the famous Chee Cheong Fun. You can try that as well. you got an excellent food blog on JB. I go from Singapore to JB for makan session with friends from time to time. Your blog is so useful. Feedback: Your inclusion of Googles Map location URL link and GPS coordinates of the food stall/restaurant is IMPORTANT. Keep doing that. Just saw the foodie blogger episode about JB and must say you were great on tv. Very natural. Thanks for all the recommendations. Great site with great info. Hope to bump into you someday while stalking out some great food. I wondered why you only "praise" those food stalls / restaurants and didn't criticize some awful food. After reading this post I know more about your Johor Kaki Blog mission. I agreed with your approach and thank you for posting many recommendations in your blog even you are not a Johorean. Keep up with your work. Your blog is a "must" read for my daily consumption. Cheers! Excellent work, Tony. Promoting u thru my facebook too. U r showing S'pore food often over-rated n even when good, the price is accounted 4. Thank you Tony. Your blog is indeed informative and we always check up your blog to find good places to eat. Congratulations on your Rewards. You have such a noble and honorable mission. You're a true food hero Tony! Thank you for your encouragement. I am no hero, just a scribe. The true heroes (often unsung) are our hawkers. Thank you Tony. Keep up the good work. I too used to lament about the lack of good food in Johor Bahru. You have proved me wrong. worse still, some of the places you have mentioned are actually very near my home. betul betul katak bawah tempurung! Hooray for guys like you! Thanks Mrs Pillay. I am glad Johor Kaki has been helpful. There are still many hawkers yet to be covered by this blog. Please do share with us your favourites too. Hi Tony , thanks for sharing your Food exploration ! really hope to join you guys if there is a chance ! keep up the good work ! Hi Tony, I too follow your foods blogs but some foods. I cannot find when I was in JB. Anyway, thanks for nice to eat foods' places. I will try to find when I in JB. Thank you so much for your postings Tony! I am a food lover just like you. I have been travelling around Johor based on your recommendations. Most of the food you recommended are very nice ah! Just 1-2 are "not very good" though. Please continue with your Blog!